Seek advice from an experienced attorney. At Bagolie Friedman, we will meet with you for a free consultation to discuss your case. We limit our practice to representing individuals in their claims for just and fair compensation for injuries. At Bagolie Friedman, we believe in this simple philosophy: the dignity and worth of the individual demands and deserves respect. We will work with you to arrange an appointment with a doctor to evaluate your health. Some exposures to dust, fumes, asbestos, chemicals, etc. are internal and may be “silent”. You may have a condition without even knowing it exists. An early examination can protect your health and your legal rights. What kinds of injuries or disease are covered? 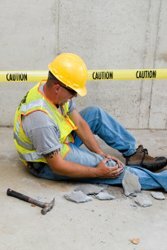 Accidental injuries: You can recover a money award for injuries suffered from an accident on the job. Exposure to Fumes and Noise: You may be entitled to a money award for a condition resulting from exposure to dust, fumes, asbestos, chemicals, noise, etc. Death Cases: The death of a worker from an accident or occupational exposure is also covered to protect dependent family members. New Jersey law provides for payments to an employee’s spouse and qualified dependents. How will I afford the legal fees and the cost of the medical examination? There is no legal fee unless we obtain money for you. Similarly, your visit to the doctor is “no risk” because you do not pay the bill unless your case is won. Is my employer solely responsible? In some instances, the injured employee can seek damages from a third party For instance, if you are injured by a defective piece of equipment or if you are in a car accident while working for your employer, there may be a case against the manufacturer of the equipment or against the other driver.